Meet Justin Forrest Parks; at 26 years-old he’s a sport climber, a Deuter ambassador, an Outdoor Research grassroots athlete and a Diversify Outdoors coalition member. He began climbing at age 16, became a world traveler at 18 and has found both passion and purpose in making the Outdoors a more inclusive community—first in Chicago where he co-founded Sending In Color and now at the National Outdoor Leadership School in Lander, Wyoming where he serves as the Diversity and Inclusion Manager. But before he was any of those things, Justin was a Black kid growing up on the south side of Chicago on Mascouten ancestral land. Both of his parents were born and raised in Chicago, one of the most segregated cities in the U.S. His mom grew up in Englewood; his dad was raised in Calumet Heights, a Black middle class enclave first integrated in the 1960s. Justin’s grandparents were part of the Second Migration of Black southerners who left the Jim Crow South after WWII in search of better prospects in Chicago; tripling the city’s Black population to over 800,000 in the period between 1940 and 1960. Then as in now, Chicago was a deeply segregated city. However, it was also a beacon of hope for the hundreds of thousands of Black southerners who found steady jobs in manufacturing plants and helped shape an renaissance of Black culture, literature and music. 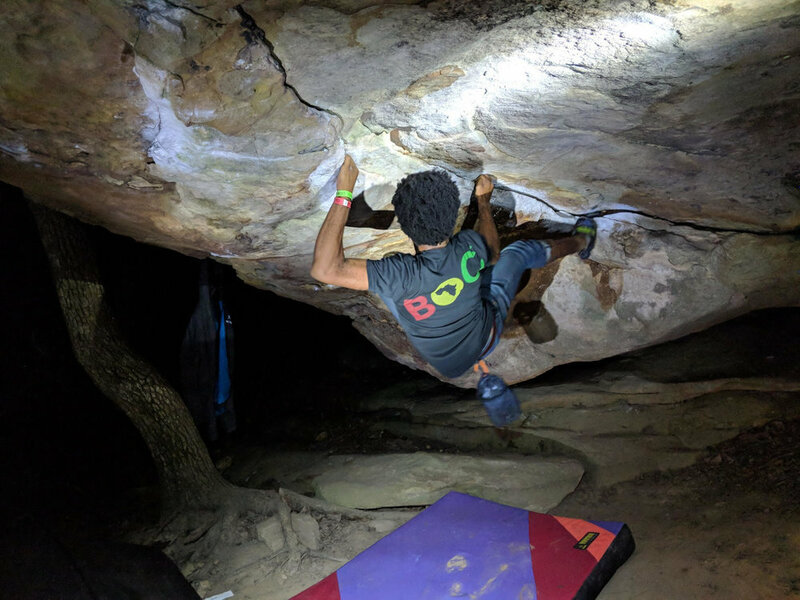 After almost ten years of “being the only one” Justin has found a community of ethnically diverse climbers through Sending In Color along with NYC based Brothers of Climbing which co-hosts the annual event Color the Crag in Steele, Alabama (Photo credit: Christine Joy Antonio). The post-war era was also an ugly period in Chicago’s history. Black Chicagoans faced employment and housing discrimination. Redlining, discriminatory federal loan practices and housing covenants prohibited Black homeownership in White neighborhoods. African-Americans were segregated on Chicago’s South Side in majority Black neighborhoods where public services were defunded or neglected. Meanwhile a decline in manufacturing jobs further devastated Black working class families. Black Chicagoans faced incredible odds including overcrowded schools, a spike in crime and gang violence, and very little economic investment—a stark contrast to Chicago’s downtown and northwest commercial districts where the vast majority of jobs and investment capital are located. Although today Chicago is one of the most prosperous cities in the U.S., the legacy of legal and de facto segregation is visible in the divide between rich and poor, Black and White, North and South. That’s one way to look at it. For Justin, the South Side was simply home. A photo of Justin’s paternal grandparents on their wedding day. Justin grew up in an apartment on the border of Roseland and Pullman that was filled with music. His mom sang and played the guitar. She defied expectations as the only Black woman to be president of the folk singer John Denver fan club at the time. She was also a carpenter and one of the few women in her union in Chicago. His dad was equally musically gifted; he played the guitar, bass drums and the keyboard. He also worked as a HVAC specialist and computer analyst. Justin’s parents met in a music store in downtown Chicago where his mother was playing guitar. According to family lore, Justin’s paternal grandfather was a strict, former military man with a low tolerance for music. In spite of this, the two fell in love and were married. The little family grew: Justin, who was born in 1992, grew up playing guitar, piano, banjo and mandolin. Eight years later, the Parks added another boy—Justin’s younger brother Austin who is a percussionist at the Merit School of Music and jams with renown jazz musicians in the city. Justin’s parents both grew up on the South Side of Chicago; his mom was raised in Englewood; his dad grew up in Calumet Heights. Part of his restlessness was grappling with “being a Black kid in this all white school in these all white neighborhoods.” Figuring out how to thrive in spaces where you’re ‘the only one’ was not that straightforward; he wanted out. His parents gave him the option to homeschool or attend a local school on the South Side; Justin chose homeschooling. It turned out to be a mistake; “I hated it—turns out I learn better with people around.” The upside was spending a lot of time getting to know his city—all of it. He began hanging out at libraries and museums as well as at prestigious public schools in downtown Chicago. The end of his private school education was actually a beginning: for the first time in his life his education became limited only by his curiosity and appetite for new experiences. In addition to homeschooling his parents exposed him to nature. Like many Black Chicagoans, Justin also has roots down south. When he was younger that meant road-trips to Georgia to attend family reunions, weddings, funerals. Growing up, he spent a lot of time wandering around on his great uncle’s land where there were horses, cows, and hound dogs. While first outdoor experiences were through his family; his first introduction to rock climbing came through his church. Justin’s parents both share a passion for music (Photo credit: Justin Forrest Parks). As a teenager, he traveled to South Africa for a mission trip with his local church. Looking back, he remarks that “I have an issue with voluntourism which I now recognize that was but I really appreciated the opportunity.” During the trip, the group flew up to Jozi and stayed for a couple hours on a game range close to Mt. Everest (the other one). One day, one of the group leaders invited Justin to accompany him to the local crag to check out some sport climbing routes. He pointed out the bolts which were the shiny things in the rocks. That’s what stoked Justin’s curiosity. Back in Chicago, 16-year-old Justin joined friends on a rock climbing trip up to Devil’s Lake in Baraboo, Wisconsin where he learned top roping. Afterwards, he got connected to a gym where he learned to lead climb. He was pretty fearless indoors which allowed him to progress quickly “while taking lots of [whippers]”—semi-controlled falls that require careful coordination between the belayer and climber to avoid serious injury. Climbing was exciting; it meant new places, new people and new experiences. It was also a familiar foray into spaces where very few people looked like him; climbing gyms in Chicago are clustered in White neighborhoods on the north and west sides of the highly segregated city. Justin also developed a serious case of wanderlust. He got into couch surfing which his mom fervently opposed—at least initially. Justin explains that “a lot of my life has been relentlessly pursuing an activity until I wear my parents down. It’s a strategy.” It’s also a strategy he came by honestly; his father used the same relentless passion for music to wear down his grandfather. Justin attended high school for one year and homeschooled for two years before obtaining his GED his senior year. He enrolled in Columbia College in Chicago and began studying cinematography. Next, he set his sights on travel. He joined AmeriCorps for two years and traveled all around the US, working in Mississippi, Alabama, New Jersey, New York, Pennsylvania and Louisiana. He was 18 years old. Next, Justin joined the Montana Conservation Corps and moved to Missoula where he took up residence in the Selway-Bitterroot Wilderness, a 1.3 million tract of protected land across Idaho and Montana located in the Bitterroot Mountain Range. His mother was not thrilled; she channeled her discontent into a robust letter writing campaign. Meanwhile, Justin adapted quickly to backcountry living. Motorized objects were prohibited in the Wilderness so the crew used classic crosscut saws to clear fallen trees from trails in the backcountry for hunters and the U.S. Forest Service. The job lasted for six months. Immediately afterwards, he moved to Australia. Australia was the culmination of a six year friendship with an Australian pen pal. The year prior, Justin and his pen pal had planned a joint trip to India and Nepal. He did his research and even found a year long position in Nepal with a media arts collective. At the last minute, however, his plans were foiled by red tape and a missing transit visa. He didn’t make the flight. Instead his pen pal ended up traveling solo through India and Nepal. Meanwhile, Justin felt the urge to get out of Chicago which led him to apply to the Montana Conservation Corps. He was 20 years old. This time there would be no red tape. Justin couchsurfed with musicians in Melbourne and explored the city. His friend flew in and then they were off to Sydney. Afterwards they stayed at a homestead in the Blue Mountains, before visiting her hometown in Byron Bay. From there they parted ways; Justin moved into a rainforest just outside of Mullumbimby. He stayed with her uncle in an A frame home while helping out with greenhouse projects. Then he came back to Chicago for love but that didn’t work out. Back in Chicago, Justin’s parents struggled to come to terms with his different hobbies. He explains that “first, my mother didn’t want me riding motorcycles. Then when I told her I was flying to Peru to climb a mountain she forgot about the motorcycle.” He traveled next to Huaraz, Peru in La Cordillera Blanca to complete crevasse rescue and glacier travel training. His goal at this point was to become a mountain guide. This was the culmination of years of reading and dreaming about mountaineering. He knew he would have to leave the country—or at least the lower 48–in order to complete high altitude training. He chose the School for International Expedition Training because the founder, Josh Buckner, provided guide focused instruction with an emphasis on technical competence and professionalism. It was a grueling course that culminated in a guided expedition up Tocllaraju, a 19,790 ft peak in the Peruvian Andes. The name is derived from the Quechua words tuqlla (trap) and rahu (snow). Three of the clients started feeling altitude sickness and had to descend back down the mountain. The rest continued their ascent only to turn back fifty feet from the summit because conditions were deteriorating. Justin was 23 years old. After Peru, he returned to Chicago in 2016 and started working at Chicago Cares as their corporate volunteer programs logistics assistant and volunteer engagement coordinator. He was dreaming of building a climbing gym on the Chicago’s South Side to increase awareness of the sport and access to Chicago’s African American communities. He ended up co-founding Sending In Color, a monthly meet-up for climbers of color in Chicago along with Pilar Amado. As a Black climber, mountaineer and international traveler, he’s used to dealing with the assumptions of others, and the consequences of stereotypes. After all, “society connotes Black with negative headlines, with bad things. But as a Black man in Chicago I can’t just know the South Side.” He’s grown accustomed to existing in two different communities: predominantly White climbing spaces and predominantly Black spaces where he grew up. Justin doesn’t offer any easy answers. As he learned as a child, it’s incredibly difficult to feel ownership in places where you are the “only one.” It can be difficult to feel welcome or included. In the mean time, he’s grateful for his ancestors and a family legacy of curiosity and exploration—and of perseverance. After all, his grandparents left the Jim Crow South and traveled over 800 miles to start a new life in a city where segregation and racial prejudice were waiting for them. His paternal grandfather fought in the Korean War only to return home to a country which continued to view him as a second class citizen. His parents pursued their love of music and raised their kids with the same desire to learn and experience the world on their own terms so that “every new experience, every hobby is an opportunity to figure out how the world works.” Now, his goal is to help others do the same.